Compagnie du Ponant has released their Summer 2013 Brochure featuring luxury cruises in The Great North, Canada, Mediterranean Northern Europe, The Baltic and Asia. Compagnie du Ponant offers travellers a unique and privileged cruise. 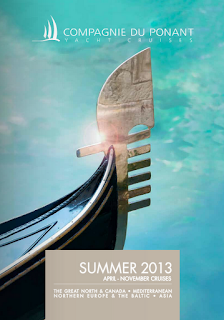 The new brochure celebrates the company's latest vessel, Le Soléal's inaugural season. Compagnie du Ponant's latest ship forms a warm and intimate atmosphere, refined design and contemporary decor inspired by the Yachting world. Le Soléal's maiden voyage begins with discovering Barcelona. New itineraries in Asia begin in October 2013 aboard Le Soléal. For the first time, Le Soléal is calling at the Land of the Rising Sun, a country rich in contrasts, where the pace is set by the energy of its huge cities and the calm serenity of the gardens. From Tokyo to Osaka, the new beating heart of Japan, via Kyoto, the romantic, from sacred gardens to slumbering sanctuaries, secular temples to the delicate landscapes of Nara, Le Soléal offers cruises that are unique and captivating. The 2013 Summer Brochure also includes new themed cruises in partnership with various companies to allow guests to experience golf, music, food, wine and beauty in a memorable way. The programs include talented experts, workshops and prestigious guests. Activities range from tasting sessions of fine wines and cookery workshops with some of the most famous French Michelin-starred chefs on a cruise between Andalucia, the Balearic Islands and the Costa Brava to the "Golf Special" in Italy, Corsica, Sardinia and Sicily. From the immaculate whiteness of the Arctic to the subtle perfumes of the Asian continent, Compagnie du Ponant's 2013 journeys abroad yachts with restricted capacity and carefully choreographed itineraries.